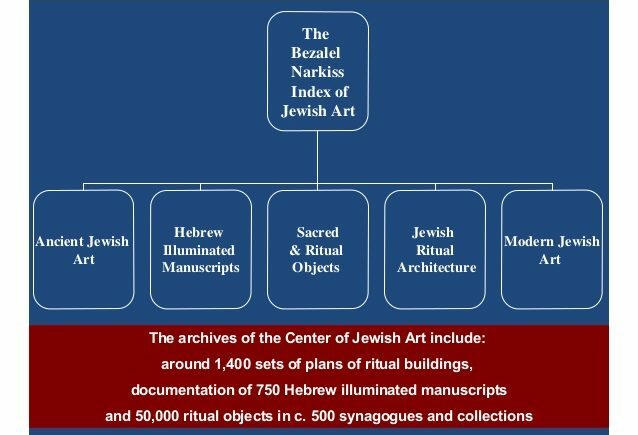 The Bezalel Narkiss Index of Jewish Art, an online digital catalogue of over a quarter of a million images was officially launched August 9th, 2017 during the annual World Congress of Jewish Studies by the Center for Jewish Art at Hebrew University of Jerusalem. The index cover many genres and historical periods - from antiquity to the present, from personal objects to architectural elements, and a great deal more from across the globe. The index's diverse holdings strengthens its manifestation of the appearance and function of "Jewish" art. The broad categories are defined by time period (Ancient and Modern), material (manuscripts, architecture), and use (ritual/personal). One can also search by artist (if known), location, collection, and type. There are pieces made by Jewish artists and objects made for Jews but not necessarily by Jews. Apparently not included are works with Jewish-themed subject matter used in a Christian context (i.e. "Old Testament" depictions). We made general and specific queries of the index using the set categories and search button features. Our first foray was into the collection of Ancient Jewish Art. The results, about twenty per page, brought up a large collection of black and white photographs of stone ossuaries. then a mix of coins, mosaics, sarcophagi, and more ossuaries. A few were in color; many, however, are historic photographs and plans. Clicking on an single image not only gives one a close up (with watermark), but also links to other images of the object or site. Not all the individual images are labeled to the same degree, but all provide geographical location, material typology, and some approximation of a date. Quite a few pieces are described in detail, though with no link to bibliography. The overwhelming majority come from Eretz Israel, with a few Diaspora mosaics, synagogue plans, and monumental panoramas. The catacombs, in other words, are going to be those at Beth She'arim, not Rome or Venosa. There also were no images of the decorated epitaphs from the tombs of Jews in Diaspora areas like Italy, Spain, and France, a large and essential supply of data on visual Judaism from the Late Antique, Byzantine, and Early Medieval periods. Our interests naturally directed us to the category of Jewish Funerary Art. It turned out to be far richer in quantity - genealogists will rejoice - and geographical reach. Perhaps because of the sheer number of images - close to 50,000! - many search fields were not yet filled out, including a transliteration of the epitaphs. The collection, therefore, is searchable by location and iconographic subject (animal, design, object, etc.). From the fields still to be filled out, however, clearly, this is only the start of a very ambitious process to contextualize and "tag". The last tryout was of the search bar, with the focus on finding ancient items of the Greco-Roman period with Jewish markers or motifs. Typing in "clay lamp" got over 1,000 hits, but none fit the type of object we were looking for. We then went with location, choosing "Rome", an important site for unique artifacts produced in Antiquity for a Jewish clientele. The 18 results were exclusively of the modern temple of Rome and examples of manuscript illumination made in the area or kept in local collections. Venosa got no hits, nor did Syracuse or Catania. Italy, however, pulled up over 1,000 results. These confirmed the suspicion that the Index's real strength lay in Jewish Art from the Modern Period, not Antiquity. It is a helpful guide to modern Judaism, illustrating many places hard to reach or not regularly open to visitors. Any Jewish heritage trip to Europe, the Middle East, and Northern Africa should use this site to plan. But the fragmentary and particular artifacts from a more remote Jewish past are underrepresented - at least for now. May the continued patronage of the generous foundations and institutions that have backed these initial results support further record of the expressions of Jewish traditions and beliefs as they were first recorded in a visual form.